More help is needed to prevent families in the UK going hungry, the Archbishop of Canterbury has said. Food is being wasted in "astonishing" amounts but hunger "stalks large parts" of the country, Justin Welby wrote in the Mail on Sunday. 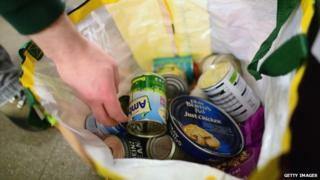 He backed a parliamentary report, to be released on Monday, which aims to end hunger in the UK by 2020. Nick Clegg said benefits sanctions were partly to blame and proposed a "traffic light system" to limit them. The deputy prime minister said sanctions - where benefit payments are stopped for infractions such as missing interviews or failing to take part in a work-related activity - should not always be imposed "overnight". The archbishop said he was left more shocked by the plight of the UK's poor than by those suffering in African refugee camps, because it was so unexpected. The parliamentary report is expected to propose a new publicly funded body, known as Feeding Britain, to tackle hunger among poor people. It is expected to call for bigger food banks to distribute more free food and advise people on how to claim benefits, a rise in the minimum wage, and the provision of free school meals during school holidays for children from poor families. The report is the work of an all-party parliamentary inquiry into hunger and food poverty, led by the Labour MP Frank Field and the Bishop of Truro, Tim Thornton. The archbishop said the report sought to "bring people together from churches, food banks, the food industry and government to make a real difference". Among the suggestions in his article, he said it should be made easier for UK food companies to pass on food they could no longer sell. After describing scenes of a refugee camp in the Democratic Republic of Congo, he wrote: "... a few weeks later in England, I was talking to some people - a mum, dad and one child - in a food bank. "They were ashamed to be there. The dad talked miserably. He said they had each been skipping a day's meals once a week in order to have more for the child, but then they needed new tyres for the car so they could get to work at night, and just could not make ends meet. "So they had to come to a food bank. They were treated with respect, love even, by the volunteers from local churches. But they were hungry, and ashamed to be hungry. "I found their plight more shocking. It was less serious, but it was here." Mr Clegg said there was "some evidence" that benefit sanctions forced people to use food banks temporarily. "Whilst it is of course necessary to have sanctions in the benefit system, I think we should introduce a sort of traffic light system so that some of the sanctions are not imposed quite as 'overnight' as they sometimes are," he said. "That might help alleviate some of the problem." The Trussell Trust, which runs more than 400 food banks, has blamed growing use of them on the rising cost of living, static incomes and changes to benefits. Business Minister Matthew Hancock said one reason use of food banks had increased was that "more people know about them". He added: "The key and essential question here is: how do you tackle these deep ingrained problems of poverty? And the single best way through that is - undoubtedly - work." A government spokesman said UK people should not go hungry because "we have enough food to go around". "While this report outlines important areas for consideration, we should remember that this country has been through the deepest recession in living memory, and sticking to this government's long-term economic plan is the best way to improve living standards," he said. Earlier this year 43 Christian leaders, including 27 Anglican bishops, signed a letter urging David Cameron to ensure people get enough to eat, saying "cutbacks and failures" in the benefits system were driving people to food banks.